Sonia Ione Morse Fisher, 85, of Waterville, OH died November 27, 2018 at Heartland of Waterville. She was born May 21, 1933 in Defiance, OH to Donelda & Monroe Morse. She married William E Fisher on March 28, 1959 in Angola, In. She was a loving, and kind mother to her 4 children; Glenda Fisher, Heidi (Scott) Knapp, William (Katie) Fisher, Eric (Donna) Fisher. Grandmother to; Scott (Ashlee), Andrew, Eric (Natalie) Knapp, Patrick & Jack Fisher, Matthew & Jessica Fisher. Great Grandmother to; Alexis & Kyla Knapp. She is survived by brother Gary Morse and Sisters in law Carol Morse and Mary Frances Fisher. 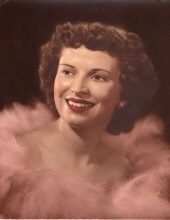 She was preceded in death by her husband Bill, parents and siblings, Terry Morse, her infant sister, her brothers in law Marion and John (Ruth) Fisher, and lifelong friend, Dixie Davis. She also leaves behind many loved nieces and nephews. Sonia cherished and loved her husband and family and loved to cook big family meals. She was a strong Christian and enjoyed attending Zion & Zoar Lutheran Churches and touched many with her faith. Sonia loved shopping for her grandchildren at Jacobson’s, and enjoyed watching English royalty, especially Queen Elizabeth. Most of all, she loved us and we loved her! She will be greatly missed. To send flowers or a remembrance gift to the family of Sonia Ione Fisher, please visit our Tribute Store. "Email Address" would like to share the life celebration of Sonia Ione Fisher. Click on the "link" to go to share a favorite memory or leave a condolence message for the family.